Manchester United have reportedly opened talks over an €80million transfer swoop for Real Madrid defender Raphael Varane. 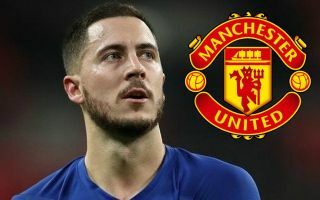 And in doing so, the Red Devils should given Madrid the extra cash they need to complete signings of their own this summer, such as for Chelsea forward Eden Hazard. This is according to Don Balon, who state that United have been in touch about signing Varane, and that Los Blancos seem prepared to sell to raise funds for their top targets. Hazard has long been linked with Real, and it seems like this summer could finally be the transfer window that sees him swap Stamford Bridge for the Bernabeu. The Belgium international has also been linked with Man Utd on occasion, though that was largely when it looked like Zinedine Zidane might get the job at Old Trafford. This seems less likely now, but United will be happy if they can get their hands on Varane to bolster their defensive options. The France international would be a huge upgrade on the likes of Chris Smalling and Phil Jones in what has long been a problem position for MUFC. And if United’s move for Varane can also help them weaken a rival in Chelsea then that’s doubly good business for the club.